Rock Art depicting owls doesn’t seem to be very common, but the few pictographs and petroglyphs of owls that I have come across so far seem to really stand apart from the rest. 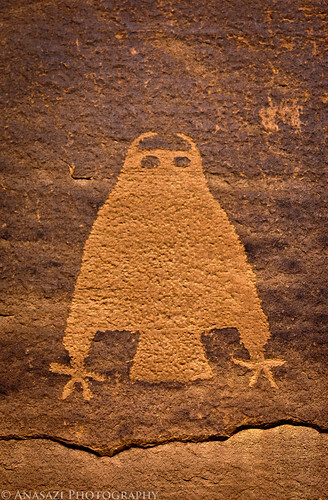 This amazingly preserved petroglyph of an owl is carved high above the canyon floor near the Colorado River and Moab. It’s hard to see from below without the use of binoculars. It’s a steep loose climb to reach this panel, which contains many more petroglyphs than just this owl, but it’s well worth the climb so you can sit back and view this great site.